One of thefirst seven 'original' American astronauts and the only one to fly Mercury,Gemini, and Apollo missions, Walter M. "Wally" Schirra passed away onWednesday, after having been hospitalized for cancer. "It'sa terrible loss of a dear friend, cherished comrade and a brother," saidSchirra's fellow Mercury astronaut Scott Carpenter. "Despite our goodnatured competition for flights into space, Wally strove to bring a smile toeveryone he met and its with a smile that I will forever fondly rememberhim." Schirra'sfirst space flight came on October 3, 1962, as pilot of Mercury-Atlas 8. Hisspacecraft, which he named Sigma 7, made six orbits of the Earth in 9 hours and13 minutes, proving that a pilot could carefully manage the limited quantitiesof electricity and maneuvering fuel that longer, more complex flights wouldrequire. Schirrachose the name Sigma because it symbolized engineering precision, and aprecisely engineered flight was the result, ending with a splashdown just fivemiles from the carrier Kearsage in the Pacific Ocean. True to his Navybackground, Schirra elected to remain aboard the spacecraft until it was liftedto the deck of the carrier. Schirra'ssecond mission as command pilot of Gemini 6, was intended to perform the firstrendezvous and docking between different spacecraft, a requirement for flightsto the Moon. But the unmanned Agena target for Gemini 6 failed to reach orbit.Gemini 6 was removed from the pad and replaced by Gemini 7, which launched onDecember 4, 1965, on a planned 14-day flight. Eight dayslater, Schirra and Thomas Stafford were in their Gemini spacecraft atop theTitan booster when it ignited, then shut down after only two seconds. Schirrahad the option at that point of aborting, ejecting himself and Stafford, but chose to remain in the spacecraft while technicians confirmed that thebooster was not going to explode. As aresult, three days later, Schirra and Stafford finally got off the ground, andless than six hours into the flight were "station keeping" just a fewfeet from astronauts Frank Borman and James Lovell in Gemini 7, 170 miles abovethe Mariana Islands. Having madehistory conducting the first rendezvous in space, Schirra and Stafford returnedto Earth. Schirra'slast flight in space teamed him with crewmates Donn Eisele and WalterCunningham for the first manned mission of the Apollo spacecraft. Their 11-dayson-board Apollo 7 qualified the redesigned Apollo for future flights to theMoon after the tragic fire that took the lives of the Apollo 1 crew in January1967. Schirralogged more than 12 and a half days in space on his three flights. WalterMarty Schirra, Jr. was born on March 12, 1923, in Hackensack, New Jersey, andattended Dwight Morrow High School in Englewood. His father was a World War Iace who later flew in air circuses. Schirra's mother did wing-walking stunts.Despite his being around airplanes, Schirra did not solo until naval pilottraining. After highschool, he spent a year at the Newark College of Engineering, then attended theU.S. Naval Academy at Annapolis, earning a bachelor of science degree in 1945.He later received honorary Ph.Ds from Lafayette College, Pennsylvania, NewarkCollege of Engineering, and from the University of Southern California. Schirraserved in the surface Navy for a year prior to pilot training at Pensacola, Florida, earning his wings in 1948. He was a carrier pilot for three years thenflew 90 combat missions in Korea as an exchange pilot with the US Air Force,shooting down two MiGs. Returning to the United States, he helped develop theSidewinder missile while stationed at the Naval Ordnance Training Station at China Lake, California. After athree year tour with the 124th Fighter Squadron aboard the carrier Lexington, Schirra attended the Naval Test Pilot School at Patuxent River, Maryland. He was flying as a test pilot at Pax River when chosen by NASA. Schirraadmitted later in life that he was reluctant to give up his Navy career for thespace program. 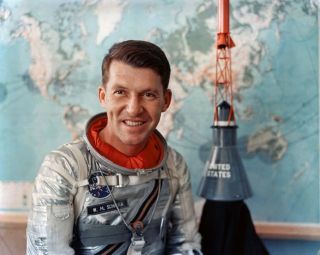 Nevertheless, Schirra was one of the seven astronauts chosen inApril 1959. A precise pilot and engineer, Schirra also became notorious for hispractical jokes. "Itwas impossible to know Wally, even to meet him, without realizing at once thathe was a man who relished the lighter side of life, the puns and jokes andpranks that can enliven a gathering," said NASA Administrator Mike Griffinin an e-mail to his agency's employees. "But this was a distraction fromthe true nature of the man. His record as a pioneering space pilot shows thereal stuff of which he was made." "Wewho have inherited today's space program will always be in his debt," hewrote on Thursdayof Schirra. In additionto his three space flights, he served as back up to Scott Carpenter in 1962,and as back up command pilot for Gemini 3, the first manned Gemini mission. Heand his Apollo 7 crew were originally assigned to fly the second manned Apolloflight, but were made back ups to the Apollo 1 astronauts in November 1966. Schirraretired from the Navy as a captain and resigned from NASA on July 1, 1969, tobecome president of Regency Investors, a Denver, Colorado-based financialcompany. He served as an officer and director of several companies, eventuallyestablishing his own consultancy, Schirra Enterprises. As a result of developing a head cold during the Apollo 7 mission, Schirra later appeared in TV commercials for Actifed, a cold remedy. He also worked as an analyst for CBS News, teaming with Walter Cronkite on broadcasts of NASA missions. He wasactive in a number of organizations and was a founding member and director ofthe Mercury Seven Foundation, later the Astronaut Scholarship Foundation. Heserved as a director of the San Diego Aerospace Museum in California, a trusteeof the Scripps Aquarium and a member of the International Council of the SalkInstitute. He wasawarded the Navy Distinguished Service Medal, three Distinguished FlyingCrosses, three Air Medals, two NASA Distinguished Service Medals, the NASAExceptional Service Medal and the Philippines Legion of Honor. In 1990, hewas inducted into the U.S. Astronaut Hall of Fame. Ten years later, Schirra wassimilarly honored with induction into the Naval Aviation Hall of Honor in 2000.In 2005, he was named a NASA Ambassador of Exploration and presented with amoon rock in his name. In 1988,Quinlan Press published Schirra's memoirs titled Schirra's Space. In2005, he collaborated on a second book, The Real Space Cowboys withauthor Ed Buckbee. Schirra issurvived by his wife Jo, daughter Suzanne and son Walter Schirra III. Biographicalinformation used in this article was adapted and excerpted with permission fromWho's Who in Space: The First 25 Years by Michael Cassutt.